To play into the theme of meeting new bloggers and making new friends, I thought this would be a good segue into the Tour through Blogland. If you remember, Rhea was kind enough to feature me in her post last week, and today I shall carry the torch. At the office, I'm working on everything -- training a new hire, trying to manage my own day to day workload, pushing to get all our new stores open by the end of the year, and in my spare time, teeing up the pipeline for next year. For the blog, I wish I could say I had a ton of awesome projects in the works, but alas, I take everything one week at a time. OK, I'm fibbing a little. Gina and I may have a little something brewing, but I don't want to spoil any surprises. Honestly, it doesn't. I don't claim that my style is different - I have succumbed to the same trends that are saturating your Instagram feed like the herringbone vest and the blanket scarf. But in the end it's all about execution, right? You could hear 23,425 people sing Whitney Houston's "I Will Always Love You," but you're still bound to find people you like or relate with more than others, right? 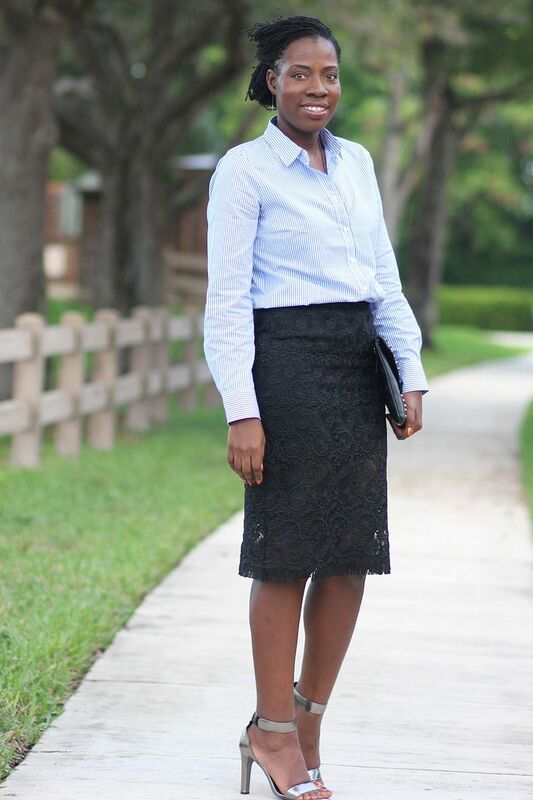 Fashion is the same way, and my goal with this blog is to simply share my outfit execution with you! I work in a male dominant industry, so my co-workers couldn't care less what I'm wearing or buying. My blog is simply my creative outlet. My chance to interact with others who share the same interests with me. 4. How does my creative writing/process work? I definitely pull a lot of inspiration from others - whether it's Pinterest or other bloggers. I'm normally picking my outfits the weekend before I wear them. I wish I had a big archive of outfits already planned and put together. I just find it difficult planning more than a week in advance because my appetite for certain outfits or looks constantly changes. I may wear the same pieces over and over again, but it's typically in combination with new pairings. Remixing is my most favorite thing to do. Sometimes, I think the best way to get to know someone is through their inspiration! So, that being said, here are my 3 Instagram crushes! When I first started blogging, I never imagined it would lead to what it is today. My first post was about my hair, Sisterlocks to be precise. That is when I noticed I had a knack for blogging, and enjoyed helping people with my topics. My blogging later progressed and I started to share my progress with learning how to apply makeup, traveling, and now reemerging into the world of fashion on a budget. Sheila is such a beautiful person inside and out! I instantly fell in love with her style and personality. She's feminine, edgy, sassy, classic, and bold. Basically my doppleganger - I know, the likeness is uncanny. I've really enjoyed fashionably getting to know her. One of these days you will see me recreate this outfit of hers here - she makes it look so effortless! Follow Sheila on Instagram HERE. Hi, I’m Danielle! 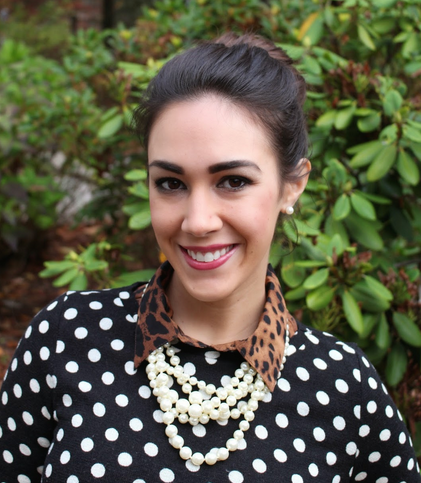 For the Love of Leopard is a fashion blog chronicling my everyday outfits. I’m just a normal girl – I work a 9-5 job and the outfits featured on my blog are things I actually wear on a daily basis. I believe that you can try out all the latest and greatest trends without breaking the bank and I love sharing fashion deals and steals with my readers. I am here to show you that fashion can be fun and attainable on any budget, that a pop of color goes a long way, and that leopard is a neutral. I mean, the girl LOVES leopard. *I* love leopard, so how can I not love her, too? She was one of the culprits responsible for making me NEED my birthday bag. She's the best at layering and is also not afraid of a good pattern mix, so I'm always able to find inspiration from her in one way or another. And guys. Check out her closet here. Tell me we weren't meant to be? Follow Danielle on Instagram HERE. I love to try and find a cheaper alternative for everythinggg. I love to travel, and am never in one place for too long. But most of all, my goal is to be able to spark passion in other people's lives through beauty and fashion. Claire is someone I stumbled upon on Instagram and am incessantly liking all of her posts. She always, always, always has the best hair and the best lashes, and I only wish I could look as cute as she does with a hat on! Outside of all that, her outfits are consistently interesting and attainable, which is important to me since sometimes your Instagram idols can look beautiful in their outfits, but you know it would never be practical in your own life. And then there are her shoes. From her flats to her stilettos, I will take one of each, please and thank you! Follow Claire on Instagram HERE. Who are your Instagram favorites, do tell! 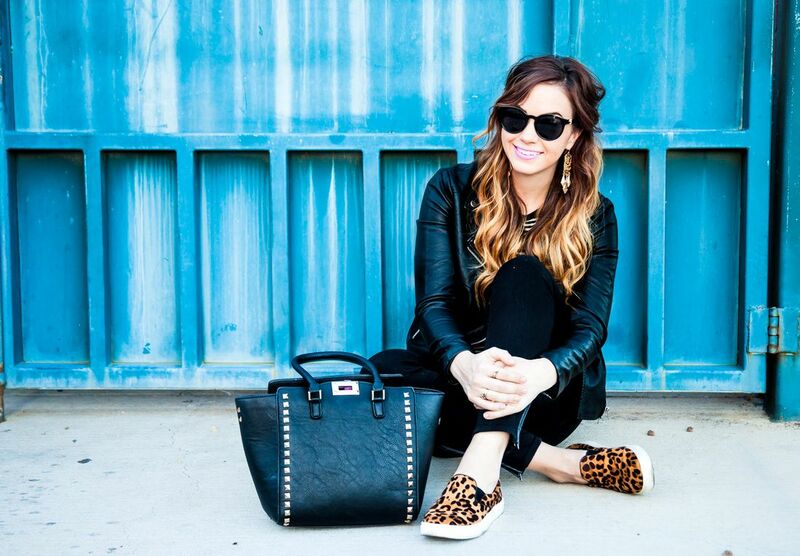 And PS: Don't forget to enter the $260 Nordstrom Gift Card Giveaway here! 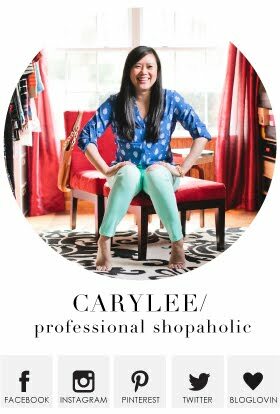 Linking up for Style to Inspire, Personal Style Monday, and Rachelle and Cha Cha for #HowIFall. Thank you for the link up, hope you're having a great start to the week! Yes, shopping is dangerous with others who love to shop as much as you! It's worth it though!! I love that bag!!! I've been saying that a lot to you lately, but you have some awesome bags. Thank you!! I have a handbag post coming this week! I had never layered two shirts together either! It's not as cumbersome as I thought it may be! And yay for meet ups! I'm still swooning over Jenna! How amazing and fun must it have been to meet up with other bloggers! You're so lucky to live close enough to a couple of the girls! I absolutely love today's look! I love the mix of colors and that bag is stunning!! Thanks so much, Erica! Wish well all lived closer! 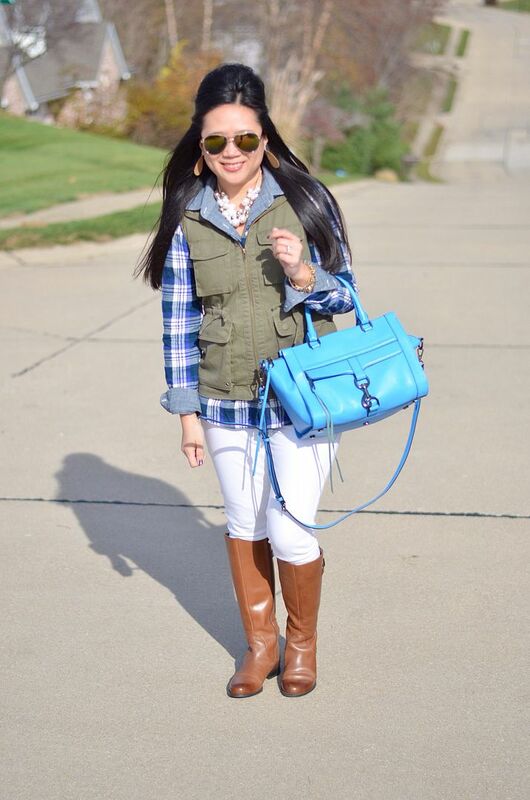 Love this casual look and I adore that vest! I think it's great that you are making amazing connections! Thank you! This vest goes with everything! It's amazing to make new friends and actually meet with fellow bloggers! I wish I had a couple bloggers who lived close by. On another note, I love your polished, casual chic look! 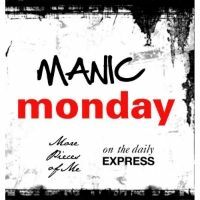 Yes, it would be great if the Manic Monday crowed was all within a 4 hour radius!! How fabulous that your meet-ups went so well, and I have forgotten how great you look in that color of blue. You and Jenna are both just so glowing and pretty in your joint-pic. Love seeing who you nominated on your tour through blogland! Some familiar faces and some surprises, too! Yay - I really wanted to introduce someone you all may not already "know." Annnd, I really wanted this shirt to be more of a forest green. So that hunt continues, tho I do still like this! Love that pretty blue plaid- and isn't Drunken Fish SO GOOD? I love that place! YASSS. I love me some drunken fish like whoa!! I love that you are getting out there and meeting other bloggers in person. That is so much fun! 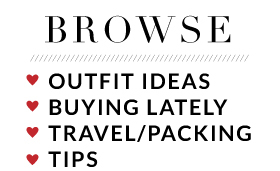 I love the concept of the Tour Through Blogland. It's great to support each other and meet new people. Your outfit is amazing as always. Yes - the support in the blogging community is addicting and contagious. Everyone I have met has been so nice - I feel lucky! Wow thanks for sharing bits n pieces of you via this tour - and Kreyola's one of my faves too! This is probably a weird thing to take away from this post but there is a Camille's in St. Louis?!?! I used to work there in high school back in Nebraska! I was OBSESSED. The food was sooo good. The store ended up closing and I miss it so much. A road trip to STL may need to happen for me; I am always looking for one haha! How great that you've gotten to meet up with such fabulous local bloggers! I enjoyed your tour here with some insight behind the scenes. I can see why you follows these gals on IG...great style from each one!! 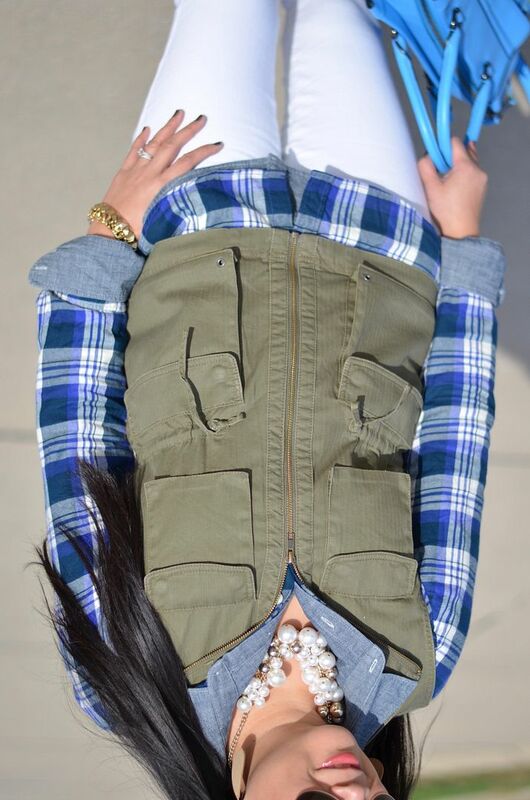 Love your plaid top, especially with the white skinnies & boots!! Thanks, girl! It's so out of my comfort zone, these meet ups! But I'm happy that everyone I've met has been easy to warm up to! And thanks! I've never layered a shirt over a shirt before. But, I liked it! So fun to meet blogger in person! Love the plaid and this casual look! Thanks, girl! And yes, I really enjoyed meeting her and am trying to strategize a second date! I would love to meet up with local bloggers in my area some day. I think that would be so much fun! You look great as always... I seriously want every accessory that you are wearing. LOL! From that necklace, to the bag and boots, all of it! lol! Ha! That is so sweet- thanks! And it is amazing how embracing other bloggers are. It really is a great community of ladies! Such a beautiful look! Loving the color combo, and your bag is really cool! :) It's great that you meet up with local bloggers, It looks like fun! So much fun! I am knocking on wood because so far all meet ups have been quite successful! Thanks for the feature once again. I think it so cool that you meet fellow bloggers that share the same passion as you. I still chuckle between the interaction between you and Gina. I'm super loving the plaid and the vest outfit by the way. This I could rock any day. When I can, I'm going to check out the ladies you feature here :). Thanks for playing along! I really do just love your style and appreciate all of your support!! I know!! I wish you could be there! I need to come to Michigan again SOON! Yes, for sure! it's the perfect complement to these types of tops! So cute! 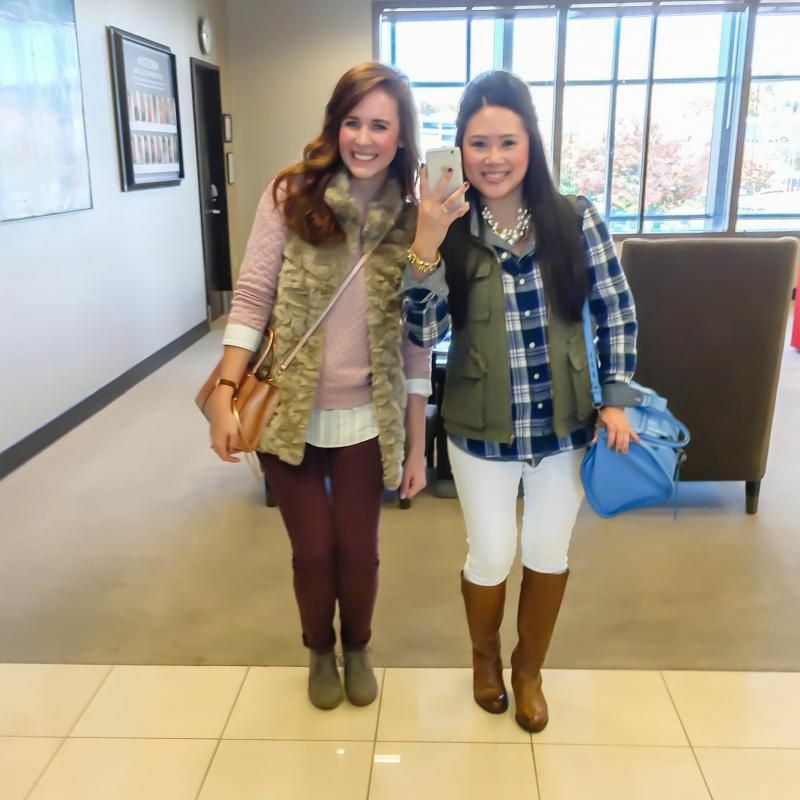 I love the olive green vest and the plaid top! 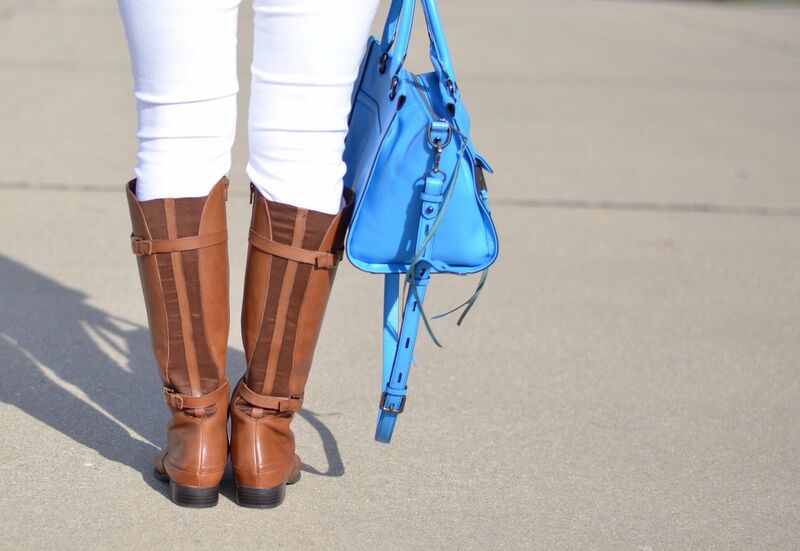 That bright blue bag is the perfect touch! Exactly! Especially since we invest so much time blogging in the first place! Nice to have that outlet! I really enjoyed this comment and I'm so glad you can relate! Thank you!! I'm so late today, but i love your layered look and cannot wait for what you and Gina are working on. My all time IG crush is Pipercase I don't think she has a blog but her outfits are always so cute. Oh thanks! Pipercase is new to me, but just followed her! I love that bright blue bag! Such a great pop of colour. Thanks! It's quickly becoming one of my favorites! I really enjoy your personal stories. Out of curiosity, what is your day job (but totally understand if you don't want to share)? 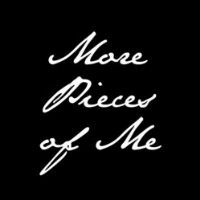 I'm always amazed at bloggers who have a full time job AND a full time blog. Kudos to you!! Oh, and love the outfit! I don't mind sharing! I work in real estate development for a restaurant. And yes, it is definitely time consuming, but I make time to blog because I definitely enjoy it and having this creative outlet that isn't as intense and stressful as my real life job! That is so great! Seriously, how did we survive before the internet?! Thanks so much! I never put my white bottoms away! Love them year round! Yay for blogger dates! I can't wait to see what you and Gina have working! I really like this outfit. You are making me realize I need some brown boots in my life. I also really like your pop of color bag! It's so amazing how we meet and make friends through the blogging world. It's amazing! I just cam from a blogging event last night, where I was meeting young bloggers to talk about how to improve their social media profiles. It was a really great experience! That's so great to hear! Love learning from each other and pulling inspiration! It's a lot of fun, and more than just fashion, you know? So great being able to meet with you, can't wait to see you at many more events! Me too! Hope there are more meetings to come! Isn't it great to meet fellow bloggers, where you can speak the same language and share blogging tips. Can't wait to hear about you new endeavors as I am sure they will be great. Enjoy the rest of the weekend. Thanks so much, Antionette! I appreciate you stopping over!